After a spirited, no holds barred match race which prevailed almost of the anti clockwise passage around the island of Saint Barths, during which there was never more than two or three boat lengths between the most established J Class rivals, it is the Velsheda crew which might impose their bragging rights over close rivals Ranger this evening. But that is only if they have enough remaining energy after the physically demanding head to head. It was only in the closing miles of this classic Saint Barths Bucket island circumnavigation challenge, that the Velsheda crew could begin to be more sure of winning. "You have to pay tribute to our owner-helmsman Ronald today," explained tactician Tom Dodson, "This really is down to him. His helming, keeping the boat fast when we needed to be, staying absolutely focused and not looking back at Ranger when they were close, made the difference in the end." Topaz, the debuting, brand new J Class held the early lead out towards the first mark after an initial three mile upwind leg. She stayed in touch and had chances to profit subsequently when the duelling ahead was particularly intense - there were several luffing matches between the dark blue hulled Velsheda and the all white Ranger. Indeed it was after one initial skirmish when both went head to wind, or close enough to it, Velsheda got its bow down quicker, built speed and managed to just escape the tentacles of Ranger, winner of yesterday's Kings Hundred Guinea Cup. 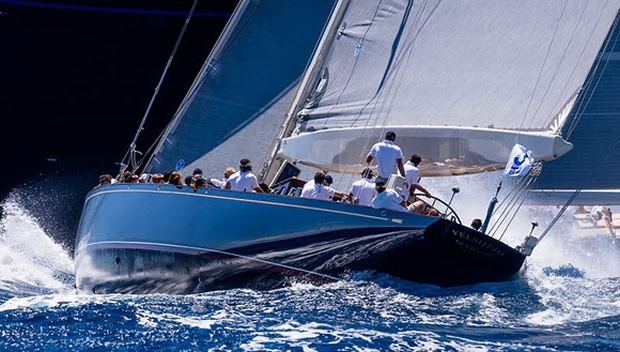 The 25 mile course offered classic Saint Barths 'brochure' conditions, 14-16 knots of southeasterly tradewinds breeze, a big swell on the windward side of the island. Under stresses of the solid wind pressure and rolling waves, both of the top teams had their hardware problems to deal with. "We have the tops off three winches right now, sorting them out, and we had a major hydraulic meltdown coming into the finish. We saw Ranger with some similar problems too. But you deal with it. It comes with the territory, racing old boats as hard as this," commented Dodson. "We have a great rivalry with Ranger. We have both been doing this for a long time and are very close at the same level and so this was a great, tough race. Literally we got ahead of Ranger on the first beat and from there it was head to head, a match race all the way from there. It really was down to Ronald in the end." At the finish line Velsheda – runaway winner of last season's premier regatta, the Cowes RYS Bicentenary regatta – was just under two minutes clear of Ranger. Topaz was third, the team buzzing from its strong early showing and content to have made big steps up its learning curve today. "It was a perfect racing day. We were good at the start, to windward and at full speed, we were first to the shore and were really perfect to start with. We are definitely getting better. We have to work on our speed loop a bit now but the boat is fast for sure," reported Matthias Adamcewski, Germany's 1988 Star Olympian and tactician on board Topaz. "We have plenty to work on. We have to have better speed upwind. It is very different to modern boats where you can use the helm more, you have to have straight line speed and power on and we have to be quicker out of our tacks." After two hours and 42 minutes of racing Velsheda finished 1 minute and 21 seconds ahead of Ranger on corrected time, Topaz two minutes and 13 seconds behind second place.